Architect Kazuyo Sejima has unveiled her design for a Japanese commuter train with semi-transparent and mirrored surfaces designed to help it blend in with the surrounding landscape. Sejima – a Pritzker Prize laureate best known for her work with Japanese firm SANAA – was commissioned by the Seibu Group to design a train for the company's 100th anniversary. The Japanese architect will redesign both the exterior and interior of the company's Red Arrow commuter train. 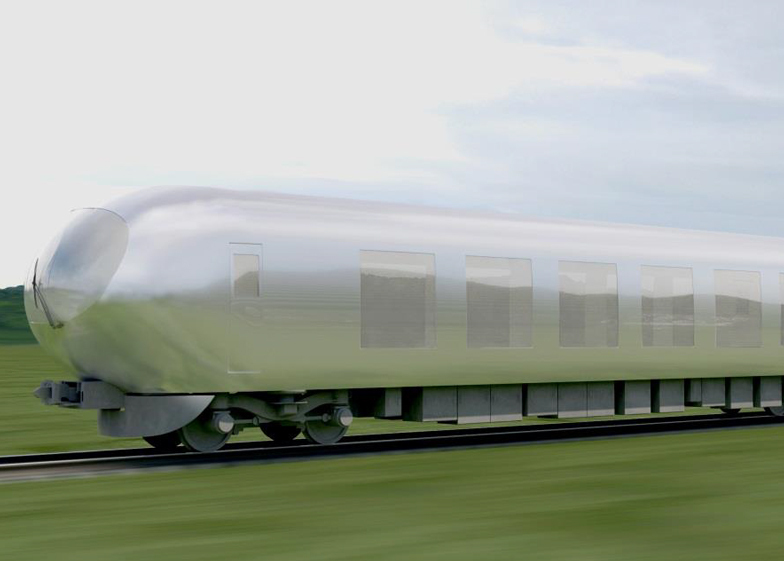 An initial rendering shows a semi-reflective surface covering the exterior of the train – something which the architect claimed had "never been seen before now." Inside, Seibu said the aim was to make the carriages feel like a "living room", so that passengers can relax whilst travelling. Her design will be rolled out on a limited number of express-route trains, and is expected to go into service in 2018. Seibu Group said that the train would be the first designed by Sejima, and that the design aimed to be "soft" and "blend into the landscape". Sejima's addition joins – and contrasts with – the company's Red Arrow series, which features boldly-coloured stripes intended to make the fleet stand out from its surroundings. Seibu Group owns Seibu Railways, which operates around 180 kilometres of railway networks around Tokyo and Saitama Prefecture. Its trains are known for their bright yellow exteriors, although more recent versions have used blue and grey. Designers and architects are frequently brought on board to update transport methods and stations, and while some are applauded, others have been met with fierce criticism. Earlier this year, a new fleet of Eurostar trains designed by Italian studio Pininfarina were slammed by fashion's elite, including the Telegraph newspaper's fashion director Lisa Armstrong, who told Dezeen that the interior design was a "considerable downgrade". "It's an assault on the eyes because it looks so cheap and plastic-y," she said. Kazuyo Sejima – alongside SANAA partner Ryue Nishizawa – has designed numerous high-profile buildings, including The Rolex Learning Centre in Switzerland and a sinuous cultural centre at the Grace Farms nature reserve in Connecticut. The pair were named Pritzker Architecture Prize Laureates in 2010, with chair of the Pritzker Architecture Prize Lord Palumbo referring to their work as "architecture that is simultaneously delicate and powerful." Image courtesy of Seibu Group.